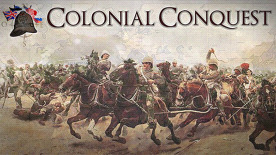 Colonial Conquest is a conquest simulation set in the Victorian age of warfare and expansion of the late 1800's and early 1900's. The object of the game is to become the dominant major power throughout the world. Players can be one among six of the great powers of the time: Great Britain, Germany, France, USA, Japan or Russia. • Return to the era of Golden Warfare and rule one of handful of powers which had been shaping the face of our present world. • Sail, ride and march across the globe as your nation flexes its military and economic muscles. • Supplement brawn with subterfuge and use cloak and dagger tactics such as subversion and espionage. • Compete with the European hegemons in their final golden days before they engulfed the world in the flames of the first global war. • Play as one of the then two raising behemoths: the United States of America or Imperial Japan; or as one of the main European power to roll them back within their boundaries. • Play against the AI or other human claimants to the mastery of our planet. You win by either scoring the most Victory Points (VPs) or being the first to reach a certain preset VP threshold, depending on scenario and custom choices in the main menu. To do so, you must capture regions over the world, and defeat your enemies in battle. The world has about 130 regions open to conquest. The regions have variable income and VP values (set randomly in the Standard scenario) and unknown until conquered or spied upon. Each region not owned by a Major Power usually has an independent Minor country owning and defending it. Each Major country is controlled by a human player or the computer, or is designated neutral and then acts as a Minor country. Hotseat play is possible, with an option to limit to 4.00 minutes the playing time per player. Each game turn represents roughly one season. Game lasts till victory conditions are achieved. The game has 3 main phases, each player entering them in sequence, i.e. Build Phase (Spring only, with: Army & Navy Construction, Fortification, Economic Aid, Espionage, Subversion), Movement Phase (Army & Navy), and Combat Phase. • Fortification Phase (Spring): Fortify army units (except in Supply Centers which are already fortified). • Economic Aid Phase (Spring): Lend money to other Major countries; which is added to their Treasury. Or Lend money to neutral Minor countries; which they use immediately to build armies. • Subversion Phase (Spring): Spend money to bribe a Minor country's army, weakening the country's defense or causing a coup (giving you control of the said country in return). • Movement Phase (All turns): Move armies to adjacent regions only. Move navies alone or with armies from one port to another (or carry regiments to amphibious landings on enemy holdings).